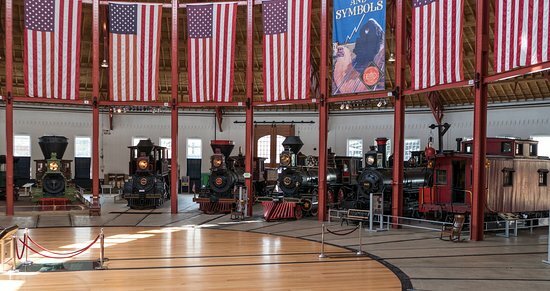 The Great Stone Viaduct Historical Education Society is pleased to announce a day trip to the Baltimore & Ohio Railroad Museum and Collection on Saturday, May 18, 2019. 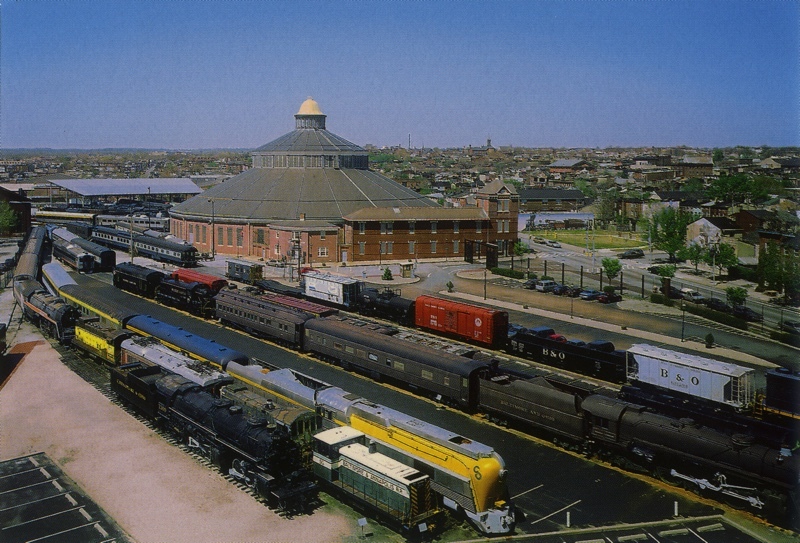 Our trip will depart Bellaire, OH from in front of Frizzi Law Offices, 224 32nd St. and travel by chartered bus to Baltimore, MD where we will tour the extensive collection at the B&O Museum and Roundhouse. This guided and comprehensive tour will take us on a nostalgic journey through the magnificent Roundhouse, North Car Shop, and Mt. Clare Station. 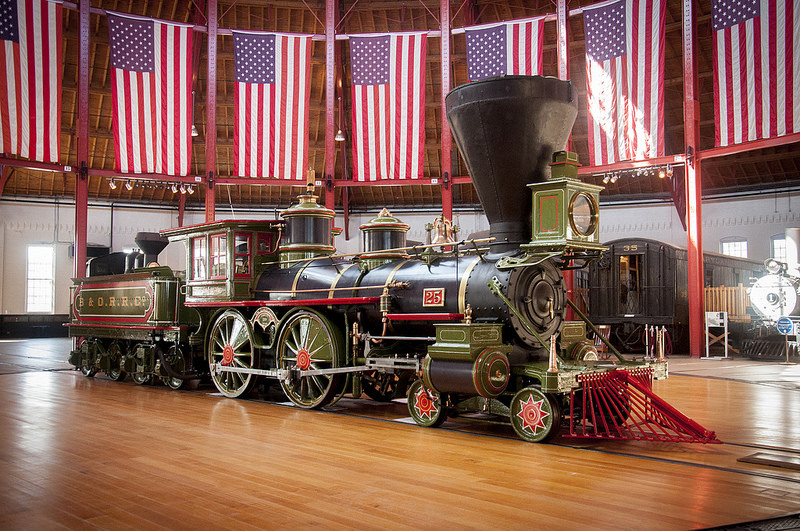 We will learn how the B&O Railroad spawned an industrial revolution, survived civil and world wars and brought about a museum collection that contains some of the first, last, best and only pieces of its kind. Also included in the tour is a 20 minute train ride in authentic B&O passenger cars pulled by an authentic B&O diesel engine. Our tour also includes a box lunch and we will eat in a picnic pavilion at the B&O Museum. AGENDA: his trip will depart Bellaire at 5:00 am by bus and arrive in Baltimore by 10:15 am. We will depart Baltimore at 3:00 pm and arrive back in Bellaire at approximately 10:30 pm. We will be making a stop for dinner on the way home and each person is responsible for the cost of their dinner. Any additional food / drink / souvenirs are the responsibility of each person as well. GSV will have water & other cold beverages available on the bus at no charge. Each person attending is responsible to supply their own devices to assist them during this tour, as well as any person they need for their assistance. The museum is handicap accessible. GSV is not responsible to provide these devices or assistance. Please let us know of any issues when making your reservation. Each person attending is responsible to supply their own devices to assist them during this tour, as well as any person they need for their assistance. GSV is not responsible to provide these devices or assistance. Please let us know of any issues when making your reservation. GSV Lifetime, Charter & Sustaining Member price is $140. NON-MEMBER PRICE IS $150. Prices include your bus transport, train ticket and box lunch. Only 50 tickets will be allotted to this trip for this group, so act soon! Send your check or money order to: GSV Society, P.O. Box 145, Bellaire, Ohio 43906. You must include the full name, address & telephone number of each person going on the trip. For more information please call 740-963-3500, extention 2 and leave a message or email us at events@greatstoneviaduct.org. TOP: (l to r) Judge Frank A. Fregiato and Attorney Daniel L. Frizzi, Jr. 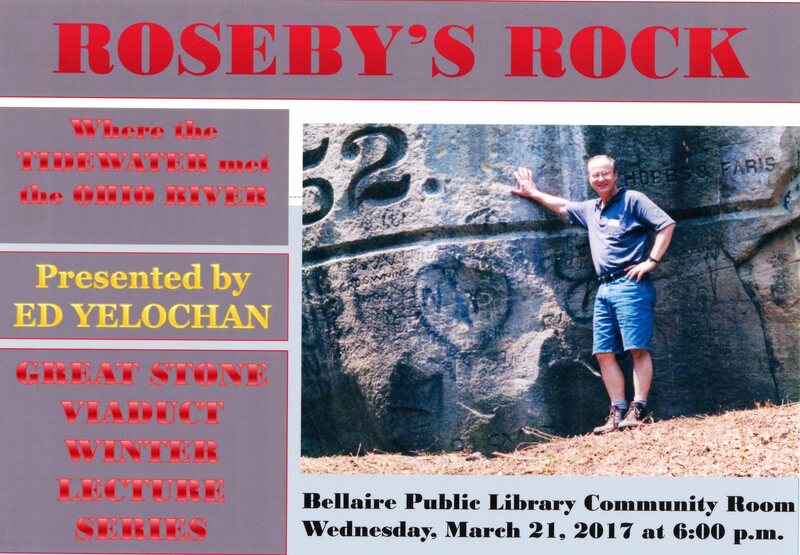 The Great Stone Viaduct Historical Education Society is partnering with the Bellaire Public Library again this year to present the 7th Winter Lecture Series providing the public with presentations of local historical topics. The popularity of the Lecture Series over the past 6 years has grown into an annual tradition, and many individuals look forward to these Wednesday night attractions held at the Community Room in the Bellaire Public Library or "On the Road" at various venues. The presentations span an 8 week period in February and March 2019. The Great Stone Viaduct Historical Education Society was the recipient of an Award for Education and Public Awareness in 2017 from the Ohio History Connection because of its sponsorship of the GSV Winter Lecture Series. 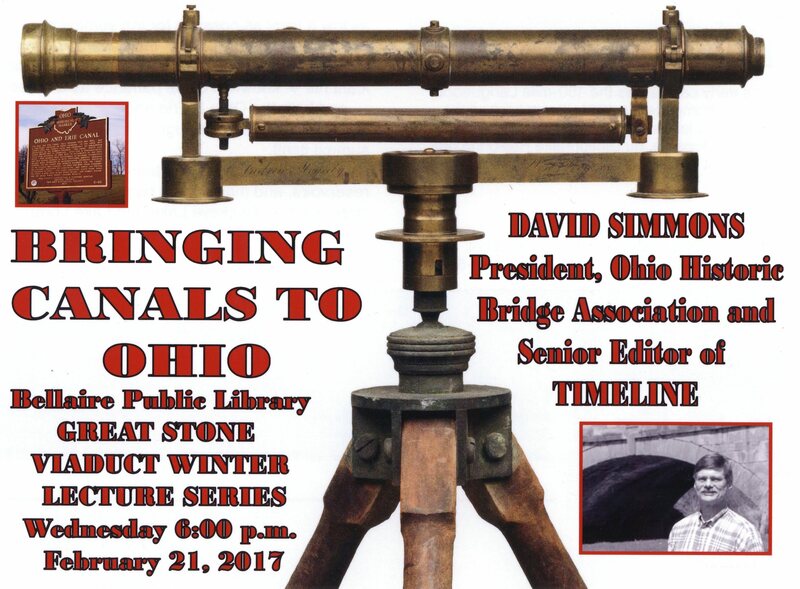 Each of presentation of the Great Stone Viaduct Winter Lecture Series is free to the public, and light refreshments are served at the conclusion of each lecture. The public is invited to attend to learn more about our local history from these informative presentations. Refreshments will be served immediately prior to and at the conclusion of each lecture. The Great Stone Viaduct Historical Education Society is pleased to announce a day trip to the Cuyahoga Valley Scenic Railroad on Saturday, September 29, 2018. 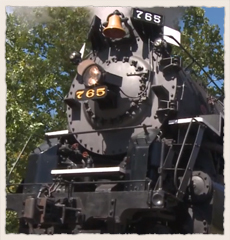 Our trip will depart Bellaire, OH from in front of Frizzi Law Offices, 224 32nd St. and travel by chartered bus to Independence, OH, where we will board our train pulled by Nickel Plate Railroad Steam Locomotive #765. 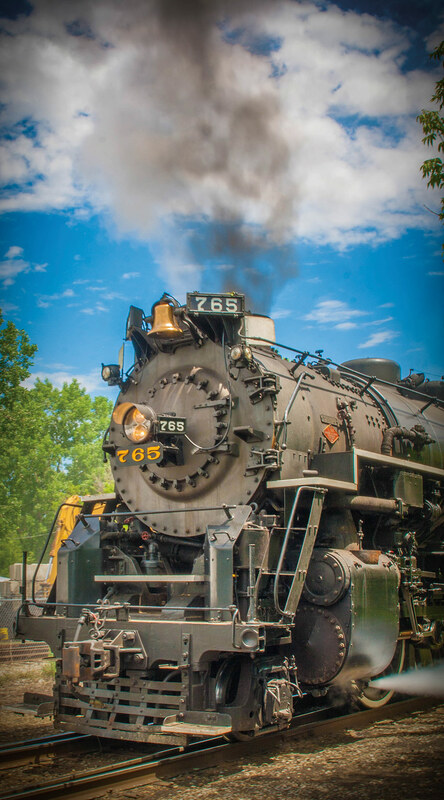 Enjoy a two-and-a-half hour round trip through the Cuyahoga Valley National Park in an authentic Nickel Plate RR steam era passenger car pulled behind steam locomotive #765. AGENDA: This trip will depart Bellaire at 8:30 am by bus and arrive at the train station in Independence by 11:30 am. Each person will get a box lunch when we arrive at the station. We will depart Independence at 4:15 pm and arrive back in Bellaire at approximately 9:30 pm. We will be making a stop for dinner on the way home at Cracker Barrel. Cost of dinner and any souvenirs are the responsibility of each person. GSV will have cold water available on the bus at no charge. GSV Lifetime, Charter & Sustaining Member price is $95. NON-MEMBER PRICE IS $110. Prices include your bus transport, train ticket and box lunch. Only 50 tickets will be allotted to this trip for this group, so act soon! The Great Stone Viaduct Historical Society is pleased to announce a day trip to the Potomac Eagle Scenic Railroad on Saturday, August 18, 2018. Our trip will depart Bellaire, OH from in front of Frizzi Law Offices, 224 32nd St. and travel by chartered bus to Romney, WV where we will board our train. 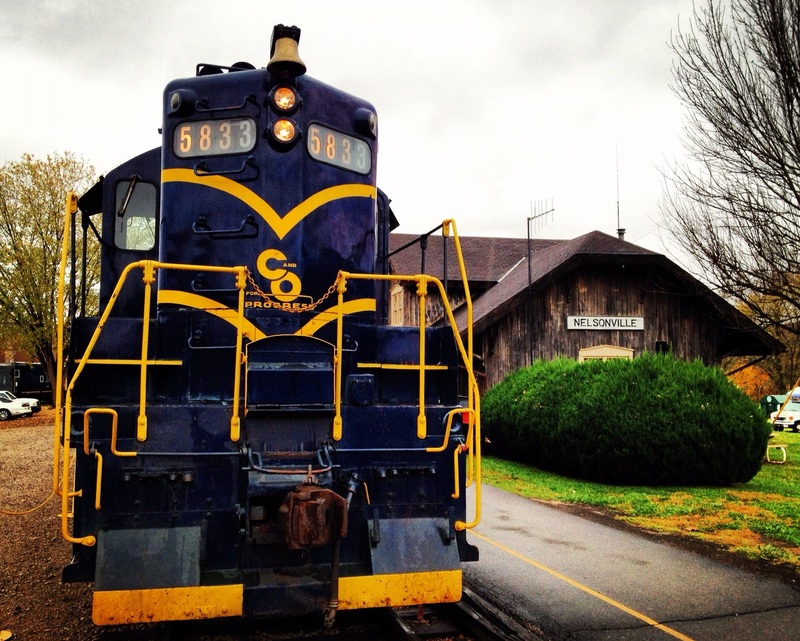 Our journey begins at Wappocomo Station, situated next to a charming homestead and a sprawling view of the mountains. Enjoy the sounds of vintage diesels as they lead you through beautiful pastures and farms dating back to the 1700s. As you wind along the South Branch of the Potomac River, you’ll enter a visually-striking gorge known as the Trough. One of the most scenic spots along the South Branch, the Trough is home to American bald eagles. This trip will include narration and concession car is available to purchase snacks and drinks. Our excursion is a 3-hour trip that goes southbound through the Trough to Sycamore Bridge and back. It is approximately 35 miles round-trip. This trip will depart Bellaire at 8:00 am by bus and arrive in Romney by 12:00 pm. noon We will depart Romney at 4:45 pm and arrive back in Bellaire at approximately 10:30 pm. We will be making a stop for dinner on the way home. All food / drink / souvenirs are the responsibility of each person. GSV will have water & other cold beverages available on the bus at no charge. GSV Lifetime, Charter & Sustaining Member price is $95. NON-MEMBER PRICE IS $110. Prices include your bus transport & train ticket. Only 50 tickets will be allotted to this trip for this group, so act soon! Send your check or money order to: GSV Society Potomac Eagle Trip, P.O. Box 145, Bellaire, Ohio 43906. You must include the full name, address & telephone number of each person going on the trip. For more information please call 740-963-3500, extention 2 and leave a message. Outback Steakhouse dinner is included! 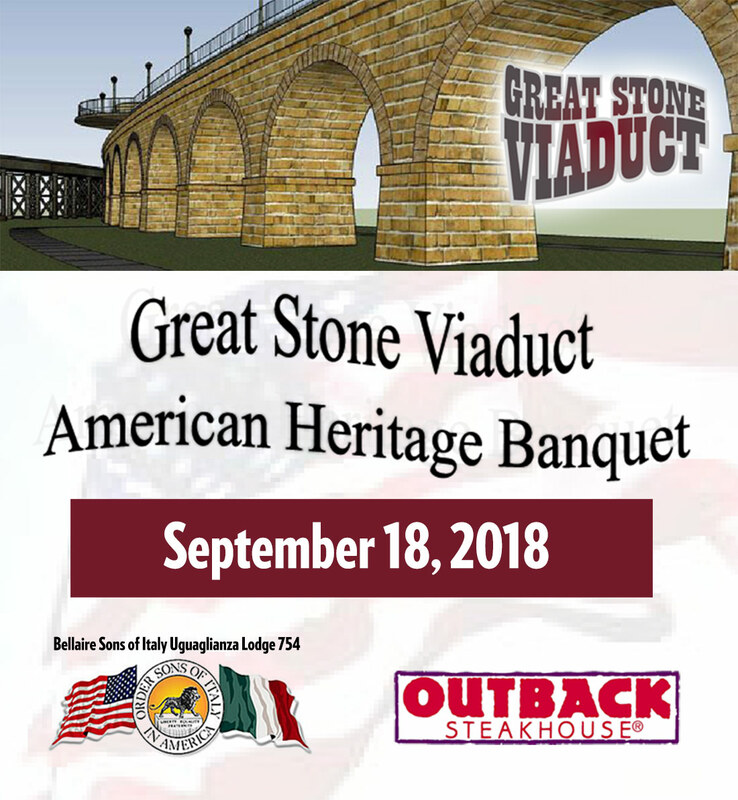 The Great StoneViaduct Society invites you to the 4th Annual American Heritage Banquet on Tuesday evening, September 18, 2018 to be held at the Bellaire Sons of Italy Lodge. This is a fundraiser for support of our mission to preserve the Great Stone Viaduct in Bellaire. Specialty Auction by David Jones of many valuable, memorable and historic items— not to be missed. GSV Society Members will receive $5.00 of Chinese Auction tickets at the door. 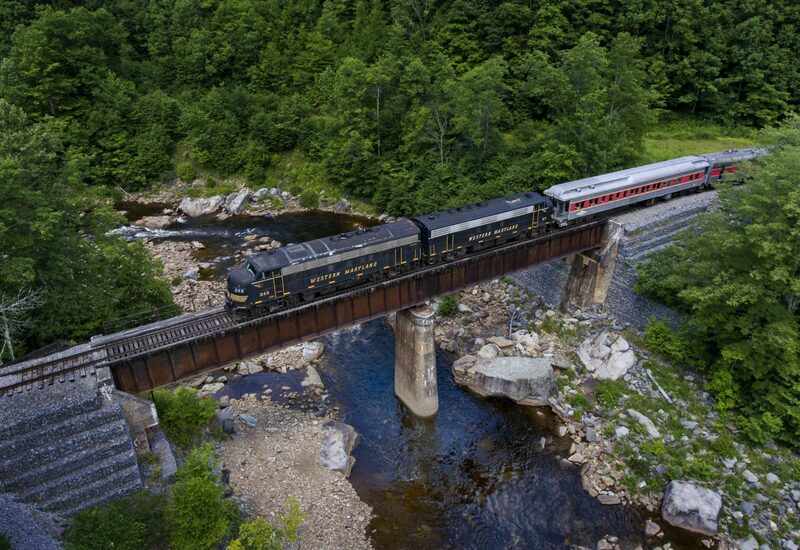 The Great Stone Viaduct Historical Society is pleased to announce a day trip to the Cass Scenic Railroad on Saturday, June 16, 2018. Our trip will depart Bellaire, OH from in front of Frizzi Law Offices, 224 32nd St. and travel by chartered bus to Cass, WV where we will board our train. This trip will include two (2) train rides in one day! We will spend 5.5 hours split between 2 trains. Our rail journey begins when we depart the Cass depot at 12:00 PM. 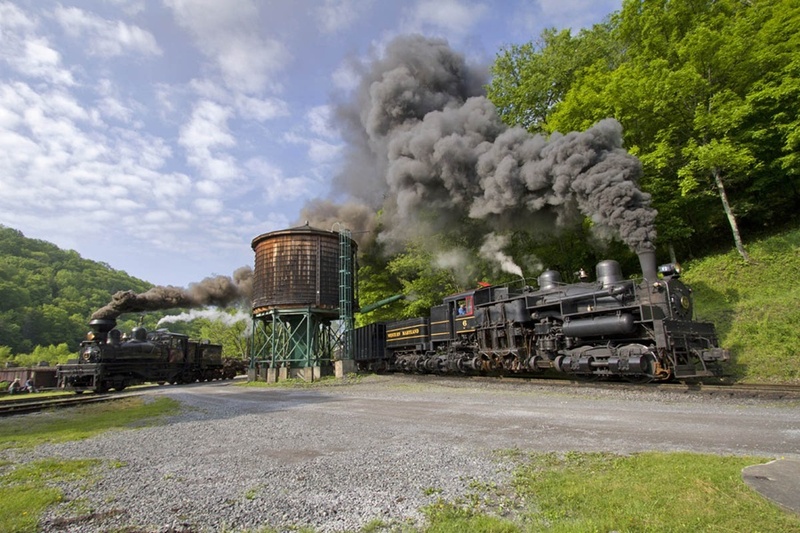 The ride is in open air, covered cars pushed by the mighty steam-driven SHAYS, up a 6% mountain grade past Whittaker Station, located four miles up the track from Cass. At the remote location of Old Spruce, we will transfer to the vintage, diesel-powered CHEAT MOUNTAIN SALAMANDER to continue our journey to Elkins. A lunch of cold cuts and condiments will be available onboard. (Lunch is included in your ticket cost) The remaining 4-hour trip to Elkins takes you through many pristine areas only accessible by rail! Stops include a 30-minute layover at the former site of Spruce, once the highest and coldest incorporated logging town east of the Mississippi, a short station stop at Cheat Bridge and lastly, a 20-minute layover at the beautiful High Falls of Cheat. Your trip will make its final arrival at the Elkins depot at approximately 5:30 PM. Guests may bring a small personal sized cooler with them as well. GSV will have cold water available on the bus at no charge. This trip will depart Bellaire at 5:15 am by chartered bus. We will depart Elkins at 6:15 pm for home and arrive back in Bellaire by 11:30 pm. We will be making a stop for dinner on the way home. All dinner costs & souvenirs are the responsibility of each person on the trip. Price includes your bus transport, lunch & tickets to both trains. Only 50 tickets will be allotted to this trip for this group, so act soon! Send your check or money order to: GSV Society Cass Trip, P.O. Box 145, Bellaire, Ohio 43906. You must include the full name, address & telephone number of each person going on the trip. For more information please call (740) 963-3500, extension 2, and leave a message. 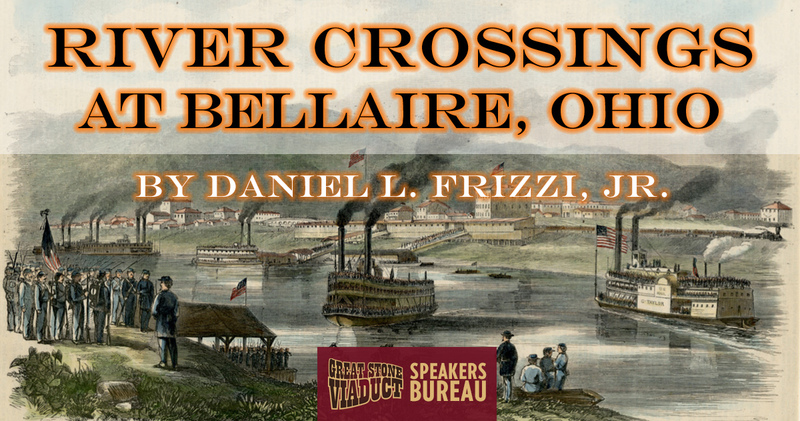 The Great Stone Viaduct Historical Education Society Speaker's Bureau presents a talk by Daniel L. Frizzi, Jr. on "River Crossings at Bellaire Ohio," at 7:00 pm, Thursday, April 26, 2018 at the Grave Creek Mound Museum, 801 Jefferson Ave., Moundsville, WV 26041. 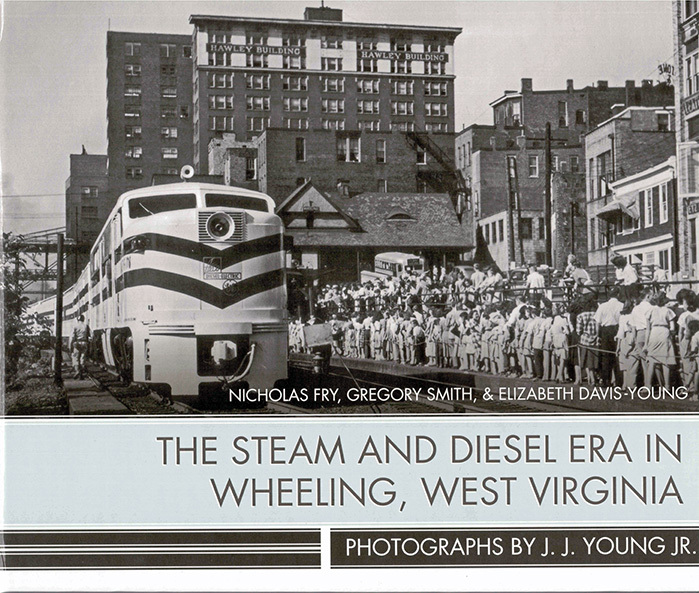 Mr. Frizzi presents a historic look at how travel and commerce moved across the Ohio River using ferries, steamships, railroading and bridges. The talk is co-sponsored by the Grave Creek Mound Museum and is open to the public with free admission. 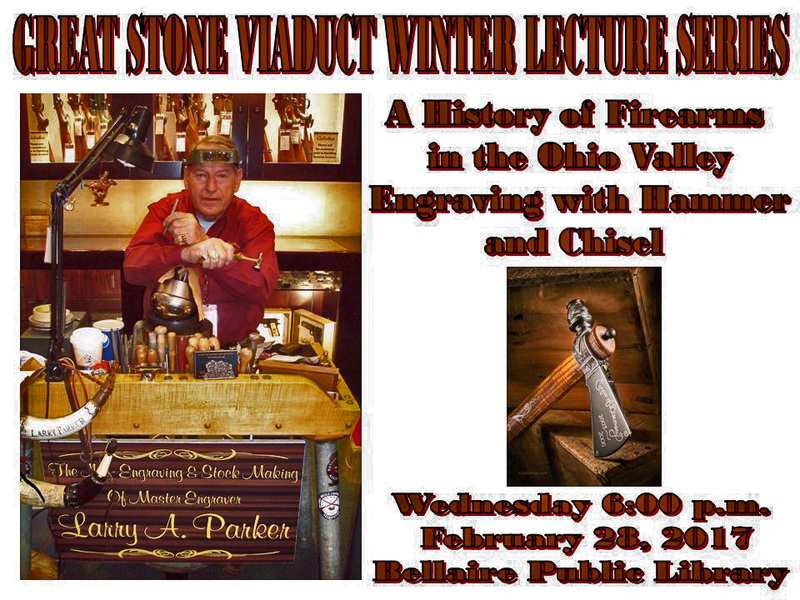 The Great Stone Viaduct Historical Education Society partnered with the Bellaire Public Library in 2013 to present the 1st Winter Lecture Series providing the public with presentations of local historical topics. The popularity of the Lecture Series over the past 5 years has grown into an annual tradition, and many individuals look forward to these Wednesday night attractions held at the Community Room in the Bellaire Public Library. Now in its 6th year, the Series has been expanded to 8 speakers over an 8 week period in February and March. 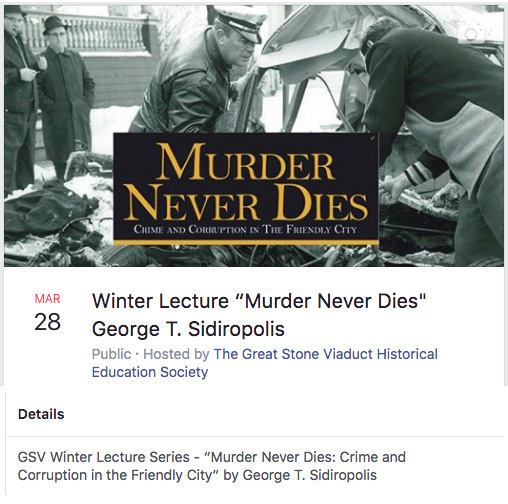 Kicking off the 6th Winter Lecture season, the Great Stone Viaduct Society has decided to take the Winter Lecture Series “On the Road” to other venues that will allow others to learn more about this Free Lecture Series that promotes public awareness and education relating to our local history. While the Bellaire Public Library, with its excellent public community room, will continue to be the main site of the Winter Lecture Series, 2 of the 8 presentations will now appear “On the Road” in St. Clairsville. The first “On the Road” presentation will take place in the Theater Auditorium at Shannon Hall, Ohio University Eastern, 45425 National Road West, St. Clairsville, Ohio on Wednesday, March 7, 2018, 6:00 o’clock p.m., and will feature Professor Michael McTeague. 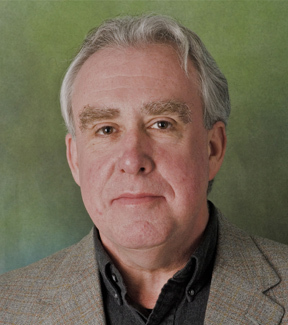 McTeague, who is has been at the local campus of Ohio University almost since its formation, will speak about the 60 year history of “Ohio University in Belmont County, Ohio”, and its impact upon the region during those 60 years. 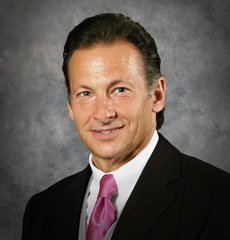 His unique style of lecturing, developed over many years in the classroom, is sure to be informative and entertaining as he relates how the presence of Ohio University in Belmont County has positively impacted so many local high school graduates, and benefited the Belmont County schools and businesses. All other Wednesday night presentations will take place in the Community Room at the Bellaire Public Library at 6:00 o’clock p.m.
Open to the public, those interested in these topics are encouraged to mark their calendars for Wednesday evenings during February and March. All presentations begin promptly at 6 o'clock p.m. Refreshments will be served immediately prior to and at the conclusion of each lecture. The GSV Society will sponsor a table with watercolor prints, decorated ceramic crocks, maps and other historical collectibles for sale to the public. 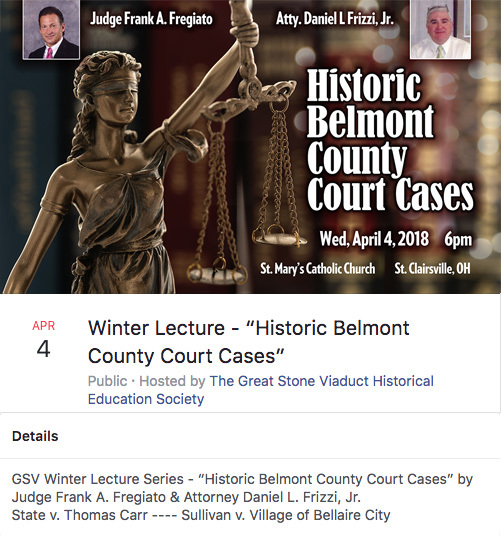 April 4, 2018 - “Historic Belmont County Court Cases”” - Judge Frank A. Fregiato & Attorney Daniel L. Frizzi, Jr. 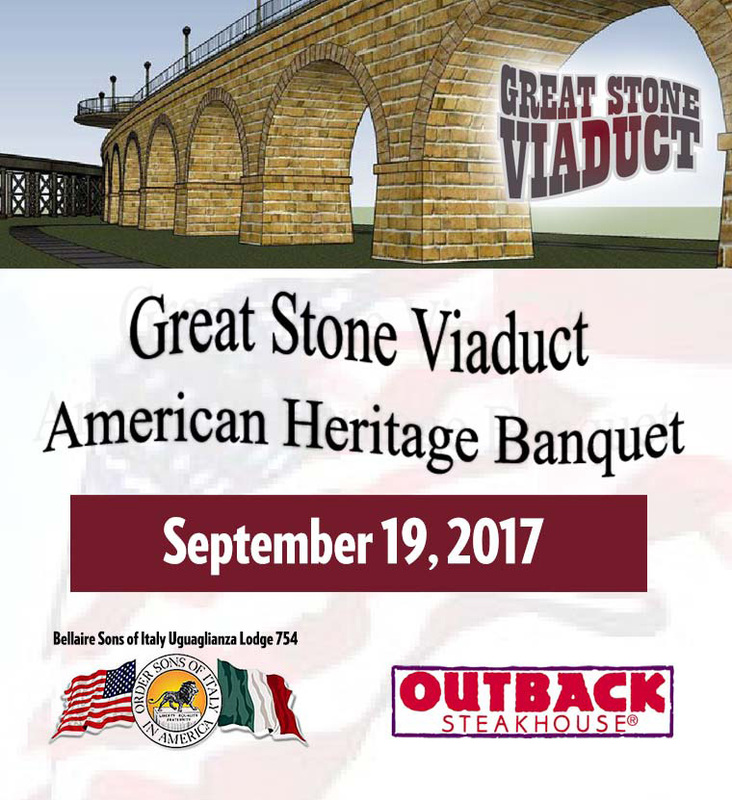 The Great StoneViaduct Society invites you to the 3rd AnnualAmerican Heritage Banquet on Tuesday evening, September 19, 2017 to be held at the Bellaire Sons of Italy Lodge. This is a fundraiser for support of our mission to preserve the Great Stone Viaduct in Bellaire. 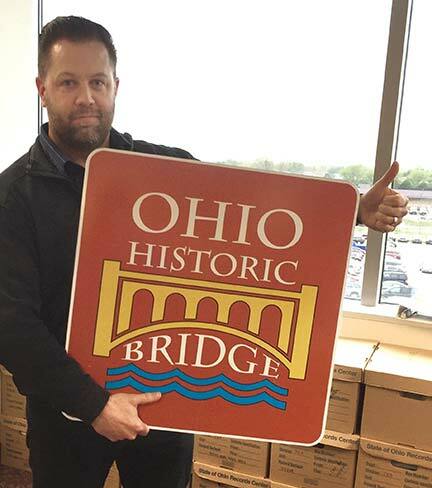 "The Historic Bridges of Ohio"
Thomas P. Barrett, Historic Bridge and Byway Program Manager with the ODOT Office of Environmental Services in Columbus Ohio will bring his preservation experiences and historical insights of many of Ohio's most interesting bridge structures. Tom has been with the Ohio Department of Transpartation for 22 years as a Cultural Resources Specialist, specializing in federally-funded bridge projects. Tom manages and promotes an award-winning state DOT Historic Bridge Program, which has inventoried thousands of structures for streamlined replacement and identified about 500 structures that are worthy of preservation and protection. In additional to his work with bridges, Tom serves as the Scenic Byways Coordinator for the 27 scenic and historic routes certified by the state and the Federal Highway Administration. 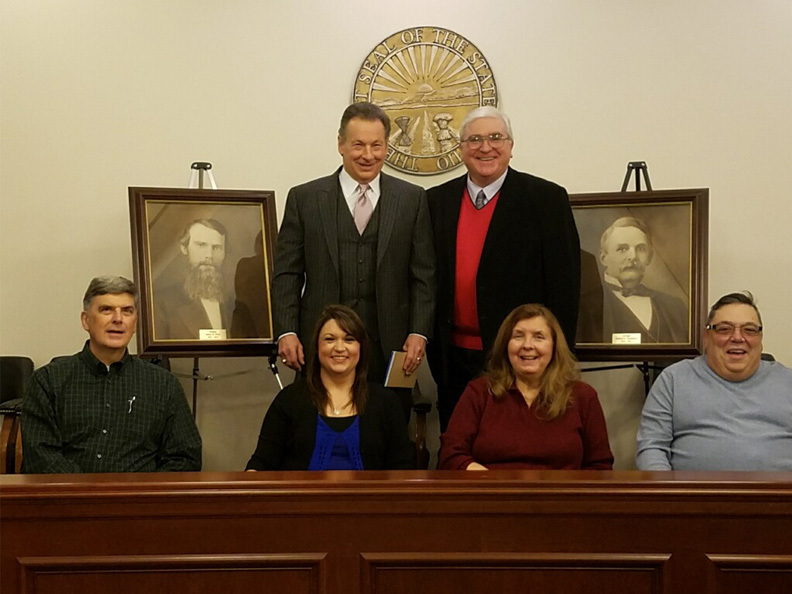 In the last two years, he has worked to help designate the Granville Scenic Byway and the Johnny Appleseed Historic Byway. In the private sector, Tom conducts historic resource studies for energy and cell tower projects throughout the Midwest. In his spare time, he enjoys family bike rides with his wife and two daughters, and tinkering with classic cars, trucks and motorcycles. The Great Stone Viaduct Historical Society is pleased to announce a day trip to the Cass Scenic Railroad on Saturday, October 14, 2017. 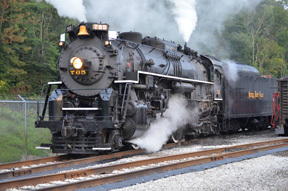 Our trip will depart Bellaire, OH from in front of Frizzi Law Offices, 224 32nd St. and travel by chartered bus to Cass, WV where we will board our train and ride to the top of Bald Knob behind a Shay Steam Locomotive. Our trip is approximately 22-miles and will last 4.5 hrs. At an elevation of 4,842 feet, Bald Knob is the third highest point in West Virginia. 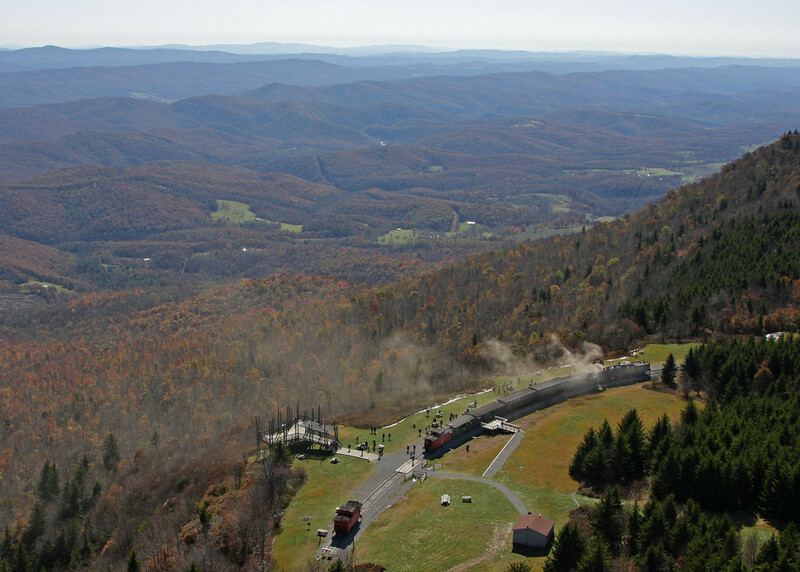 Located 11 miles up the mountain from Cass, the Bald Knob overlook offers spectacular views (on a clear day) into two states and into the valley below, home to the National Radio Astronomy Observatory. The train will also make a stop at Whittaker Station for a 30 minute layover on our way up the mountain. 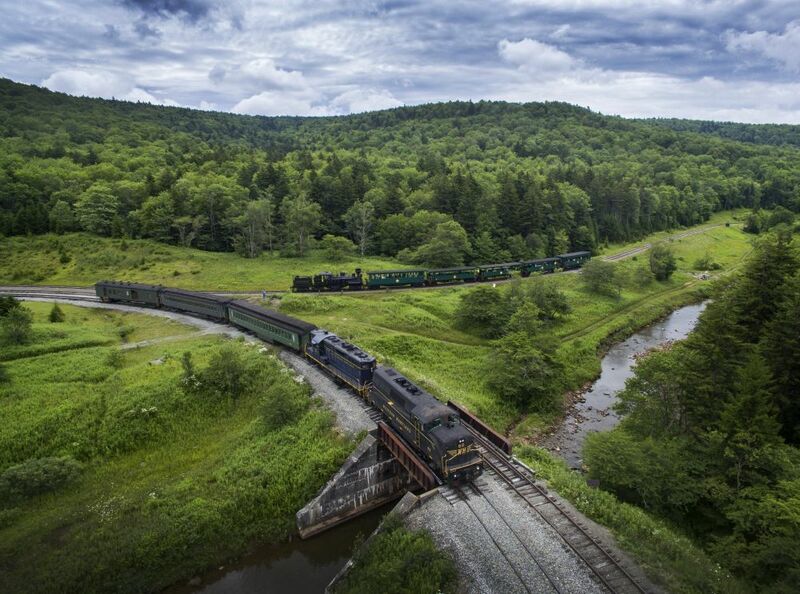 The Cass Scenic Railroad is the same line built in 1901 to haul lumber to the mill in Cass. The locomotives are the same Shay locomotives used in Cass during that time, and in the rainforests of British Columbia for more than a half-century. Many of the passenger cars are old logging flat cars that have been refurbished. Cass is the home to the world’s largest fleet of geared Shay locomotives. Six Shays, one Heisler and one Climax reside here. 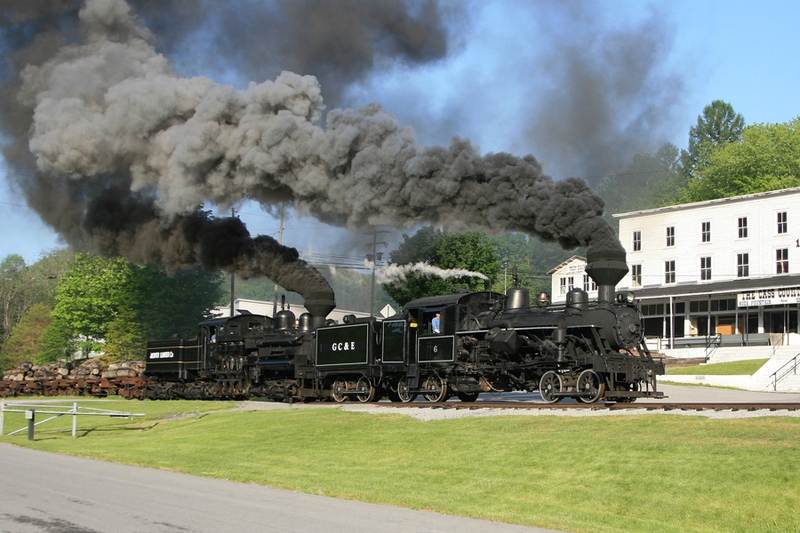 The legendary turn-of-the-century class C-80 Shay, #5 has been toiling up Cheat Mountain for nearly 100 years, making it one of the oldest engines in continuous service on its original line, and the second oldest Shay in existence. A box lunch is being provided for all persons going on the trip. Guests may bring a small personal sized cooler with them as well. GSV will have cold water available on the bus at no charge. This trip will depart Bellaire at 5:15 am by chartered bus. We will depart Cass at 4:45 pm for home and arrive back in Bellaire by 11:30 pm. We will be making a stop for dinner on the way home. All dinner costs & souvenirs are the responsibility of each person on the trip. GSV Charter & Sustaining Member price is $135.00. NON-MEMBER PRICE IS $150.00. Price includes your bus transport, boxed lunch & train ticket. Only 50 tickets will be allotted to this trip for this group, so act soon! Send your check or money order to: GSV Society Pittsburgh Trip, P.O. Box 145, Bellaire, Ohio 43906. You must include the full name, address & telephone number of each person going on the trip. For more information please call 740-963-3500, extension 2 , and leave a message. The Great Stone Viaduct Historical Society is pleased to announce a day trip to the Western PA / Heinz History Museum & Strip District on Saturday, July 8th, 2017. 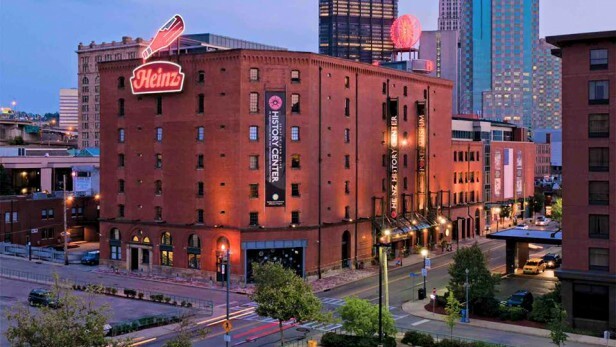 Our trip will depart Bellaire, OH from in front of Frizzi Law Offices, 224 32nd St. and travel by chartered bus to Pittsburgh, PA where we will tour the Western PA / Heinz History Museum followed by shopping and sightseeing in the famous Strip District area of Pittsburgh. The Senator John Heinz History Center includes the Heinz History Center & The Western Pennsylvania Sports Museum, The 370,000 square-foot museum presents compelling stories from American history with a Western Pennsylvania connection in an interactive environment perfect for visitors of all ages. Since 2000, the History Center has been a proud affiliate of the Smithsonian Institution. The museum’s Smallman Street home combines the former Chautauqua Lake Ice Company building with a five-story Smithsonian wing. The Western Pennsylvania Sports Museum, a museum-within-a-museum located on the History Center’s second and third floors, celebrates Western Pennsylvania’s unsurpassed sports legacy. From football to baseball and hockey to golf, the Sports Museum highlights the region’s passion for amateur and professional sports..
Over the past 20 years the Strip District has truly become an international destination with not only Italian, Greek, and other European immigrants opening their businesses here but it’s become the home to Asian, Middle Eastern, African, Mexican, Caribbean, Central American, and South American businesses as well. The Strip District is not only home to businesses selling products from around the globe but it’s also increasingly home to businesses selling goods made in the greater Pittsburgh area and has truly become an international destination. Everyone from foreign diplomats to travel bloggers love to visit the Strip District and we love to welcome them. While most think of the Strip as the place to go for food and food related items there are a number of wonderful specialty retailers selling everything from gifts to home furnishings and jewelry to housewares. Many of the specialty retail shops in the Strip carry merchandise that is either locally produced and/or is rare and hard-to-find. 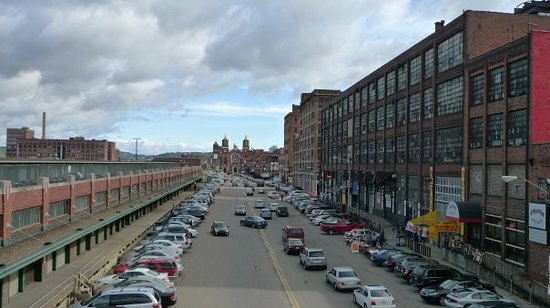 The Strip District is Pittsburgh’s historic market district and has long been the hub that’s helped to feed not just the city but the entire region. Today that’s still true and you can find all sorts of grocery items in the Strip often at great discounts over your suburban chain grocers. The History Museum tour will last from 10:30 am till 12:30 pm. After the guided tour is over we will proceed to the Strip District via bus where we will be dropped off for 3 hours. ** Please note ** There will *not* be any formal tour / schedule for the Strip District. Everyone will be free to move about on their own and experience the shops / restaurants as they wish. We will provide a map of the Strip District to all passengers. Lunch will be on your own, however GSV will give all passengers $10.00 cash to use towards their lunch or whatever they desire. There will be a set time to meet and the bus will pick us up where we are dropped off. Please note that there will be a lot of walking while in the Strip District. This trip will depart Bellaire at 9:30 am by chartered bus. We will depart Pittsburgh at 3:45 pm for home and arrive back in Bellaire by 7:30 pm. We will be making a stop for dinner on the way home. All dinner costs & souvenirs are the responsibility of each person on the trip. GSV Charter & Sustaining Member price is $55.00. NON-MEMBER PRICE IS $65.00. Price includes your bus transport & admission to the museum plus $10.00 towards lunch cost. Only 50 tickets will be allotted to this trip for this group, so act soon! Send your check or money order to: GSV Society Pittsburgh Trip, P.O. Box 145, Bellaire, Ohio 43906. You must include the full name, address & telephone number of each person going on the trip. For more information please call 304 280 6640. The Great Stone Viaduct Historical Society is pleased to announce a day trip to the Hocking Valley Scenic Railroad on Saturday, May 27, 2017. Our trip will depart Bellaire, OH from in front of Frizzi Law Offices, 224 32nd St. and travel by chartered bus to Nelsonville, OH where we will board our train. The train departs the Nelsonville Depot for a round-trip ride along the historic Hocking River Valley. Sights along the ride include one of the remaining Hocking Canal locks and the Hocking River and the hills of the Hocking River Valley! Our trip lasts approximately 1 ½ hours. 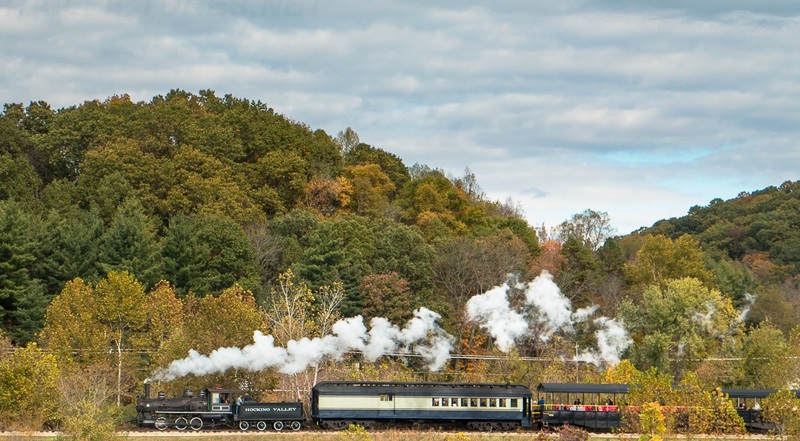 The Hocking Valley Scenic Railway, erring more on the history side than anything, has been providing volunteer-operated weekend train excursions from Nelsonville for over forty years! The train traverses a portion of a 145-year-old route that once linked Southern Ohio with Columbus and Lake Erie. We will be providing a box lunch, (sandwich, sides, cookie) for all persons going on the trip. Box lunches will be distributed when we arrive in Nelsonville. The train is made up of historic equipment ranging from 1917 to the 1960s. While food and drinks are not available on the train, you are more than welcome to bring your own food and non-alcoholic drinks on board. This trip will depart Bellaire at 8:00 am by chartered bus. We will depart Nelsonville at 3:00 pm for home and arrive back in Bellaire by 7:00 pm. We will be making a stop for dinner on the way home. All dinner costs & souvenirs are the responsibility of each person on the trip. GSV Charter & Sustaining Member price is $75.00. NON-MEMBER PRICE IS $85.00. Price include your bus transport & train ticket. Only 40 tickets will be allotted to this trip for this group, so act soon! Send your check or money order to: GSV Society Hocking Valley Trip, P.O. Box 145, Bellaire, Ohio 43906. You must include the full name, address & telephone number of each person going on the trip. For more information please call 304 280 6640. 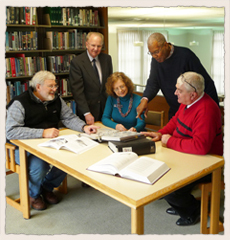 The GSV Society will partner again this winter season with the Bellaire Public Library to sponsor a Local History Winter Lecture Series using the Community Room as the setting for the lectures and displays which accompany the speakers. Held on Wednesday evenings during the winter months of February and March. The topics to be covered this year will once again bring together lecturers who are knowledgeable about the topics they present, while providing visual aids that will bring these topics to life. February 1, 2017 - “Through the Lens” a commemorative book chronicling life in our region in photographs. 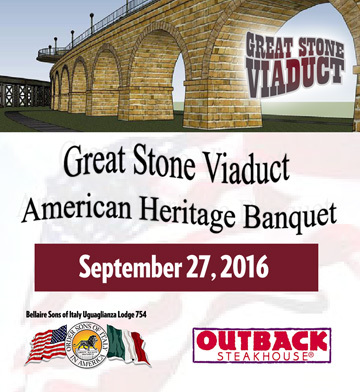 The Great StoneViaduct Society invites you to the 2nd AnnualAmerican Heritage Banquet on Tuesday evening, September 27, 2016 to be held at the Bellaire Sons of Italy Lodge. This is a fundraiser for support of our mission to preserve the Great Stone Viaduct in Bellaire. "The New Frontier of America's Railway Heritage: The Projects and Ideas Shaping 21st Century Railroad History and Preservation"
For fifty years, historian, curator, and railroader John Hankey has been deeply involved in efforts across the country to preserve and present railroading's past. He suggests that collectively, that many different communities of railway history and preservation are entering a new era of creativity and prosperity. The Great Stone Viaduct project is one of dozens in North America that would have seemed impossible just twenty years ago. John will share examples of innovative railroad heritage efforts, his thoughts about the future of historic preservation, and why the remaining arches of the great Benwood-Bellaire Bridge are so special. John Hankey is an independent scholar, curator, historian, and railroader. A native of Baltimore, he served the B&O Railroad in a variety of capacities including company historian, locomotive engineer, and Curator of the B&O Railroad Museum. He holds a BS from the John Hopkins University, an MA as a Hagley Fellow at the University of Delaware, and did further graduate study at the University of Chicago. He retains current qualifications as a Locomotive Engineer and Conductor, and is Adjunct Professor in the University of Nebraska-Omaha Department of History. Hankey also is Curator of the Western Maryland Scenic Railroad, a major heritage and economic development railroad operation in Maryland. He is a frequent contributor to Trains Magazine and other publications. Presently he is a consultant to railroads, railroad museums, and historic preservation projects throughout the United States. Presently he is a consultant to railroads, railroad museums, and historic preservation projects throughout the United States. Don't miss this spectacular nighttime viewing of the Great Stone Viaduct. We plan to light up the viaduct arches in the evening after the dinner event. 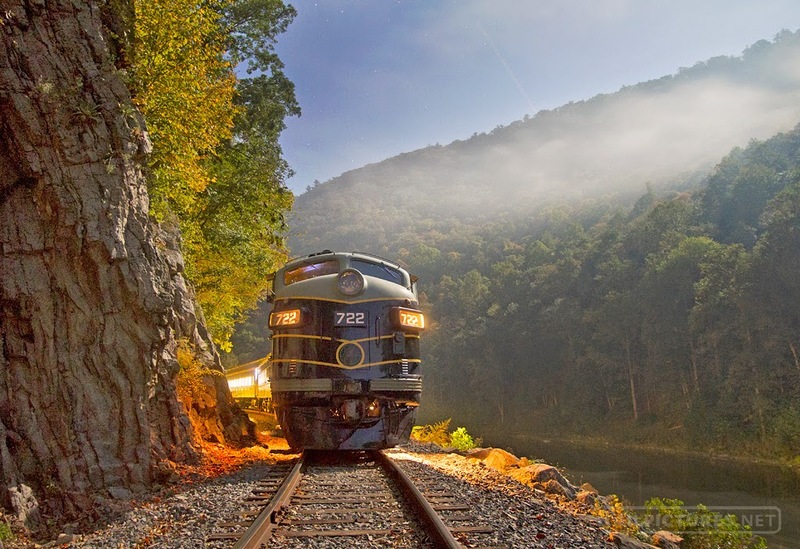 The Great Stone Viaduct Historical Society is pleased to announce a day trip to the Potomac Eagle Scenic Railroad on Saturday, October 15, 2016. Our trip will depart Bellaire, OH from in front of Frizzi Law Offices, 224 32nd St. and travel by chartered bus to Romney, WV where we will board our train. This trip will depart Bellaire at 9:30 am by bus and arrive in Romney by 2:00 pm. We will depart Romney at 6:30 pm and arrive back in Bellaire at approximately 11:30 pm. We will be making a stop for dinner on the way home. All food / drink / souvenirs are the responsibility of each person. GSV will have water & other cold beverages available on the bus at no charge. GSV Charter & Sustaining Member price is $105. NON-MEMBER PRICE IS $115. Prices include your bus transport & train ticket. Only 50 tickets will be allotted to this trip for this group, so act soon! Send your check or money order to: GSV Society Potomac Eagle Trip, P.O. Box 145, Bellaire, Ohio 43906. You must include the full name, address & telephone number of each person going on the trip. For more information please call 304 280 6640. The Great Stone Viaduct Historical Society is pleased to announce an all-day rail trip aboard Amtrak on Saturday, August 13, 2016. 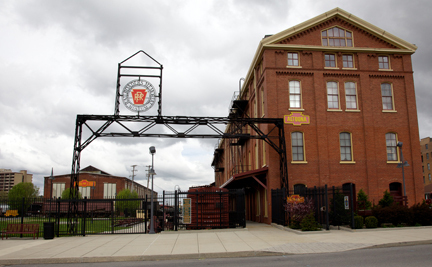 Our trip will depart Bellaire, OH from in front of Frizzi Law Offices, 224 32nd St. and travel by chartered bus to Pittsburgh, PA where we will board Amtrak’s Pennsylvanian and travel to Altoona, PA for a day of sightseeing and adventure. While in Altoona, we will tour world famous Horseshoe Curve which carries the Norfolk Southern mainline over the mountains of central PA. Also on our agenda is a tour of the magnificent Altoona Railroader’s Museum which provides a historical look back on the operations of the Pennsylvania Railroad from the turn-of the-century up to and including modern operations by Norfolk Southern. This trip will depart Bellaire at 5:30 am and arrive in Altoona at 10 am. We will depart Altoona at 5 pm and arrive back in Bellaire at approximately 10 pm. All passengers will be treated to a box lunch provided by GSV and dine at the Railroader’s Museum before our tour. While onboard the train, passengers may purchase a fresh salad, sandwich or other snack in the café car which will be open for both the trip over and return. The Pennsylvanian will travel from downtown Pittsburgh over the former Pennsylvania Railroad mainline to Altoona. As we approach Altoona we will travel over the world-famous Horseshoe Curve. Each person attending is responsible to supply their own devices to assist them during this tour, as well as any person they need for their assistance. GSV is not responsible to provide these devices or assistance. Please let us know of any issues when making your reservation. GSV Charter & Sustaining Member price is $150. NON-MEMBER PRICE IS $160. Prices include your bus transport, train ticket and box lunch plus admission to the Horseshoe Curve and Railroader’s Museum. Only 50 tickets will be allotted to this trip for this group, so act soon! Send your check or money order to: GSV Society Altoona Trip, P.O. Box 145, Bellaire, Ohio 43906. You must include the full name, address & telephone number of each person going on the trip. For more information please call 304-280-6640. The Great Stone Viaduct Historical Society is sponsoring a tour of The Age Of Steam Roundhouse in Sugarcreek, OH on Saturday, April 23, 2016. In addition to the roundhouse tour, our group will travel to Berlin, OH for 2 hours of shopping & sightseeing in Ohio Amish Country. We will be stopping for a late lunch / early dinner at the Dutch Valley Restaurant on the way home. This trip will commence at 7:30 a.m. by bus transport from Bellaire, Ohio to Sugarcreek, OH. 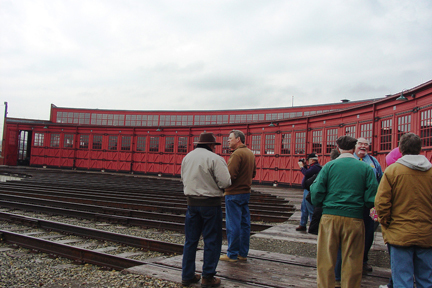 Our tour of the roundhouse is scheduled at 10:00 am and will last approximately 2 hours. 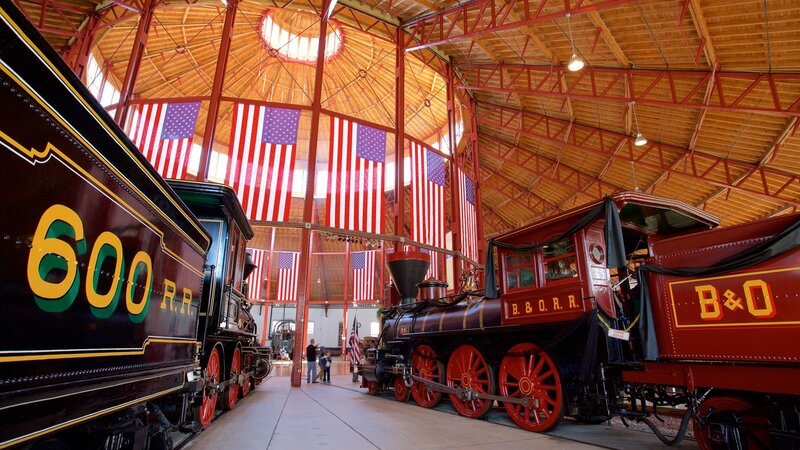 Please note that the Age Of Steam Roundhouse is a real working facility and they have set certain rules that we must follow while visiting. No children under 10 years of age will be admitted and any child that is under 18 years of age must have a signed release by the custodial parent or legal guardian. All visitors must wear flat-bottom shoes and socks. No sandals, no high heels, no flip-flops, or any kind of open toed shoe. Also note there could be some oil & grease in areas we tour so do not wear your best clothes, jeans, tennis shoes & t-shirt or similar top is suggested. 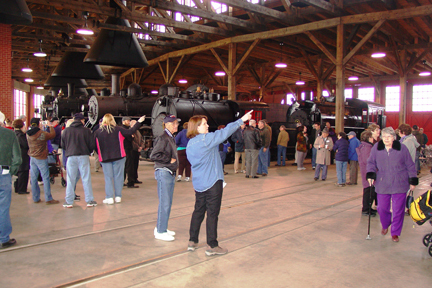 In return for visiting their facility, The Age Of Steam Roundhouse requires that all photographs and video taken in their facility be used for the purpose of personal viewing only. No images shall be posted to the internet (Facebook, Twitter, Instagram, etc.). All visitors must sign a liability release. We will have copies on the bus for everyone to sign on Saturday when we leave Bellaire. This a walking tour, and each person attending is responsible to supply their own devices to assist them during this tour, as well as any person they need for their assistance. GSV is not responsible to provide these devices or assistance. Please let us know of any issues when making your reservation. GSV MEMBER ticket price is $95.00, and NON-MEMBER ticket price is $105.00. Prices include your bus transport, admission to the roundhouse and $15.00 cash towards the cost of your meal. Only 50 tickets will be allotted to this trip for this group, so ORDER NOW TO AVOID BEING CLOSED OUT. Send your check or money order to: GSV Society Roundhouse Trip, P.O. Box 145, Bellaire, Ohio 43906. Include the name, address, telephone number of each person who will be included in your party. For more information please call 304-280-6640. Open to the public, those interested in these topics are encouraged to mark their calendars for Wednesday evenings during February and March. All presentations begin promptly at 6 o'clock p.m. Refreshments will be served immediately prior to and at the conclusion of each lecture. The GSV Society will sponsor a table with watercolor prints, maps and other historical collectibles for sale to the public. 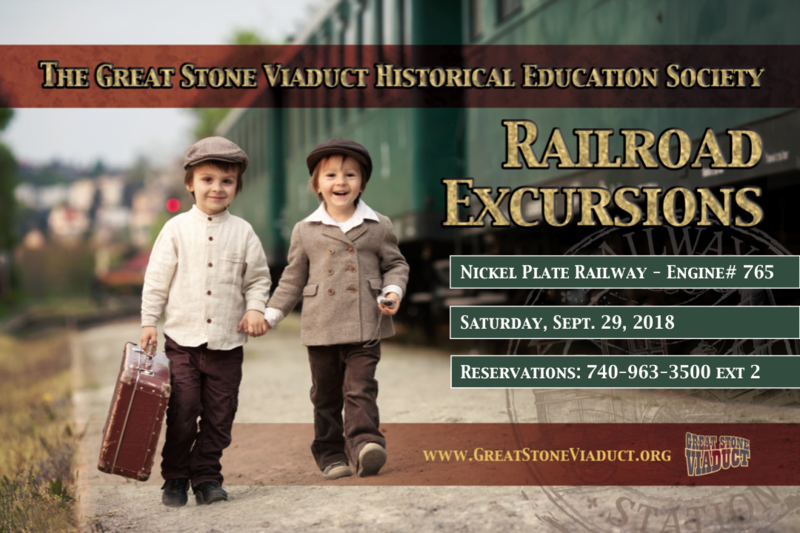 The Great StoneViaduct Society will sponsor a 2 hour excursion on the Cuyahoga Valley Scenic Railroad on Saturday, September 26, 2015 departing from Akron, Ohio. The train will be pulled by the pride of the Fort Wayne Railroad Historical Society, former Nickel Plate Road Berkshire Locomotive No. 765 which has operated extensively over the last several years, most recently on the Norfolk Southern Steam Program. Our passenger car will be located behind the locomotive and features opening windows which will allow passengers to experience the sights, sounds and smells of the steam engine at work. This trip will commence at 8:30 a.m. by bus transport from Bellaire, Ohio to the Akron, Ohio station. The group will be treated to a box lunch provided by the GSV Society before passenger boarding of the train. The group will board the train and depart Akron at 11:30 a.m. We will return to the station around 1:30 p.m. Passengers will have photo runbys for video or pictures of the 765 at track speed. This trip will follow the Cuyahoga River Valley through scenic woodlands and marshlands inhabited by the American Bald Eagle. Bus transport back to Bellaire will arrive approximately 4:15 p.m.
GSV MEMBERS ticket price is $75.00, and NON-MEMBER PRICE IS $85.00. Prices include your bus transport, train ticket and box lunch. Only 45 tickets will be allotted to this trip for this group, so ORDER NOW TO AVOID BEING CLOSED OUT. Send your check or money order to: GSV Society 765 Trip, P.O. Box 145, Bellaire, Ohio 43906. Include the name, address, telephone number of each person who will be included in your party. For more information please call 304 280 6640. – Buy your tickets now! 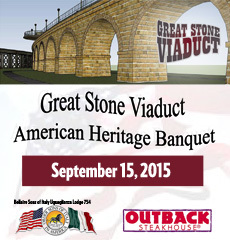 The Great StoneViaduct Society invites you to the American Heritage Banquet on September 15, 2015 to be held at the Bellaire Sons of Italy Lodge. This is a fund raiser for support of our mission to preserve the Great Stone Viaduct in Bellaire that the GSV Society recently inked a purchase agreement for. Banquet Speaker: Judge Frank A. Fregiato at 8:00 p.m.
speaking on "I Have a Dream - Heritage in Family, Community and Country"
7/4/2015 11:44 AMVisit Historic Harper's Ferry with the GSV Society - NEW TRIP!!! Harper's Ferry is a quaint 19th Century Civil War Era town at the confluence of the Potomac and Shenandoah Rivers, made famous by the raid of John Brown against the Federal Arsenal in his revolt against slavery. The Chesapeake and Ohio Canal, and the Federal National Park, are all within walking distance of the downtown. There are shops, dining establishments, and much to see and do. 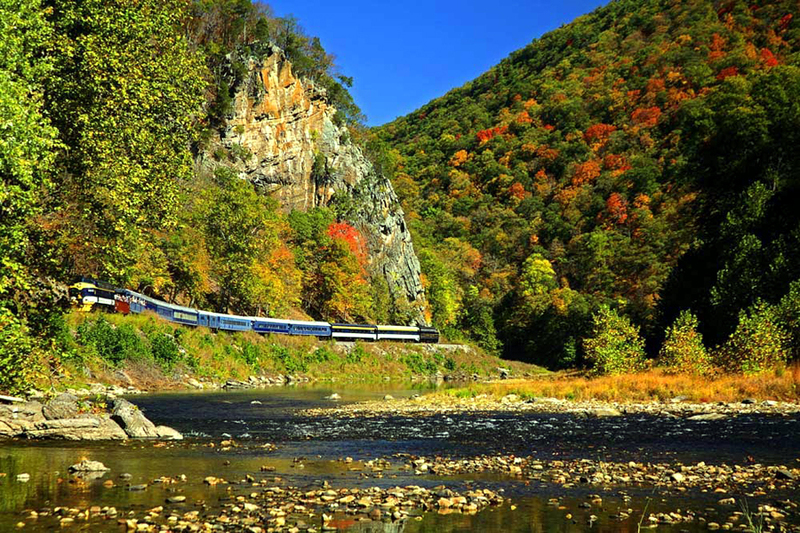 The mainline of the railroad passes over the Potomac River into and through a tunnel below the Rocky Cliffs forming part of the Appalachian Trail. A scenic and picturesque place to visit and accessible in one day. 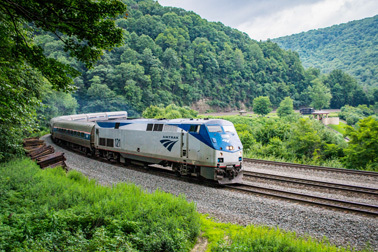 This One Day trip, with departure from the Pittsburgh Amtrak Station via the Capitol Limited to Harper's Ferry at 5:20 a.m., and return to Pittsburgh at midnight, is at the perfect time of year. All transportation between Pittsburgh and Bellaire, Ohio is provided by Charter Bus. *Member entitled to invite one (1) family member guest at the same per person Member Price. 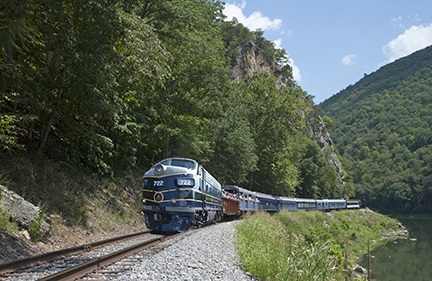 Breakfast and Supper will be available in the dining car aboard the Capitol Limited at a reasonable cost, and lunch can be taken at any of the pubs and eateries in Harper's Ferry. To learn more, go to the Visitor's Guide at http://historicharpersferry.com to learn more. RESERVATIONS: First come, first serve. Limited to 50 passengers. For information call Dave Slie at 304-280-6640 or email us at gsvsociety@aol.com . Make checks payable to and mail to: GSV Society, P.O. Box 145, Bellaire, OH 43906. Include name,address, phone number and email address. Contact us to make a PayPal payment. Payments due by July 27, 2015. Departure time is 3:30 am Sat., Oct 17. Arrival back in Bellaire at 1:00 am Sunday. GSV Society is not responsible for changes to train schedules or fares, or injuries which may occur during rail transport while en route to and from Harper's Ferry, or bus transport to and from Bellaire, Ohio. All reservations are final and cannot be changed once ticketed with Amtrak. All parties responsible for their own meals and beverages on this trip. An Amtrak flyer will be made available to all passengers listing time schedules, and the GSV Society will not be responsible for anyone missing the bus or the train. This ride features two separate mountain grades, an “S” curve tunnel, passage into a 1,500 feet deep canyon with steep, densely forested slopes, and a high bridge over the rushing Shavers Fork of the Cheat River. 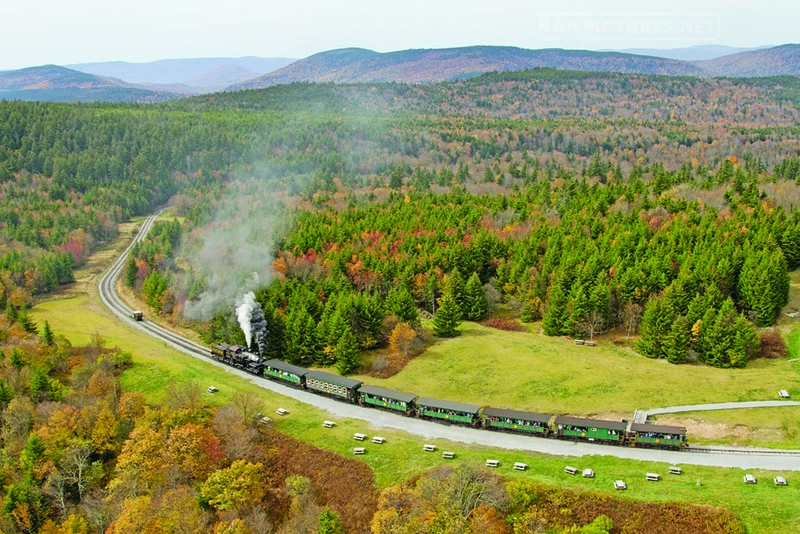 This smooth climate-controlled passenger train has gained a reputation as one of the most exciting mountain wilderness excursion rides in the US. The 4-hour, 46 mile round trip departs at 11 AM from the restored Elkins Depot on Railroad Avenue. 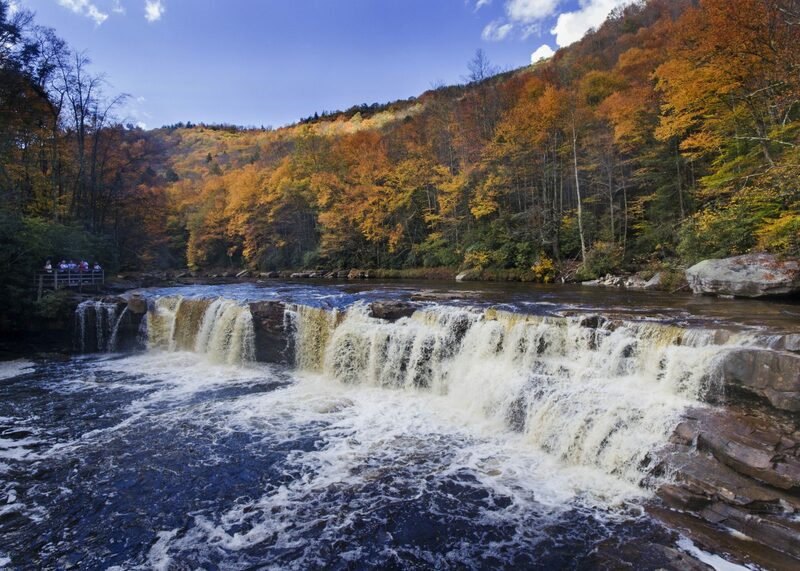 This trip culminates at the inspirational “High Falls of Cheat,” an 18′ high, 150′ wide waterfall in one of the most remote and pristine settings in the Eastern United States. A DELICIOUS LUNCH BUFFET IS INCLUDED IN THE TICKET PRICE! Concession Buffet-Rolls, Lunch Meats (Ham, Roast Beef & Turkey & Condiments), Pasta Salad, Fruit cup, Potato Chips, Lettuce, Tomato, & Onions, Bread & Butter Pickles. Cookies for Dessert: Chocolate Chip, Sugar & Oatmeal – Drinks include – Iced Tea, Coffee & Water. GSV MEMBER ticket price is $110.00 and NON-MEMBER PRICE IS $125.00. Prices include bus, train ticket and lunch on the train. We will stop at a restaurant on the way home for dinner. Each ticketholder will receive a $10 dinner allowance from the GSV Society. Trip departs Bellaire at 6:15am and will arrive back in Bellaire at about 8:30pm. Only 55 tickets will be allotted to this trip for this group, so ORDER NOW TO AVOID BEING CLOSED OUT. Send your check or money order to: GSV Society Elkins RR Trip, P.O. Box 145, Bellaire, Ohio 43906. Include the name, address, telephone number of each person who will be included in your party. STEAM POWERED LOCOMOTIVE RAIL EXCURSION! 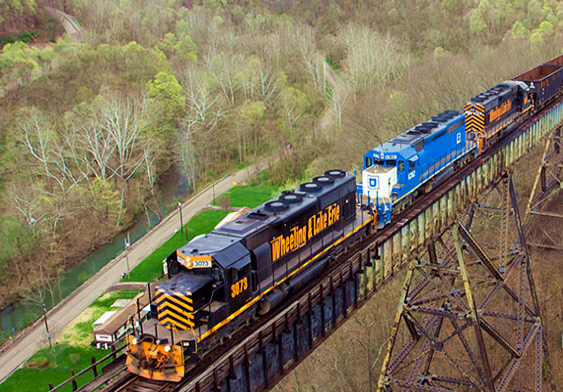 The Great Stone Viaduct Society will sponsor a rail excursion on the Cuyahoga Valley Railroad on September 6, 2014 between Brecksville, Ohio and Akron, Ohio. The train coaches will be pulled by the Fort Wayne Railroad Historical Society Berkshire Locomotive No. 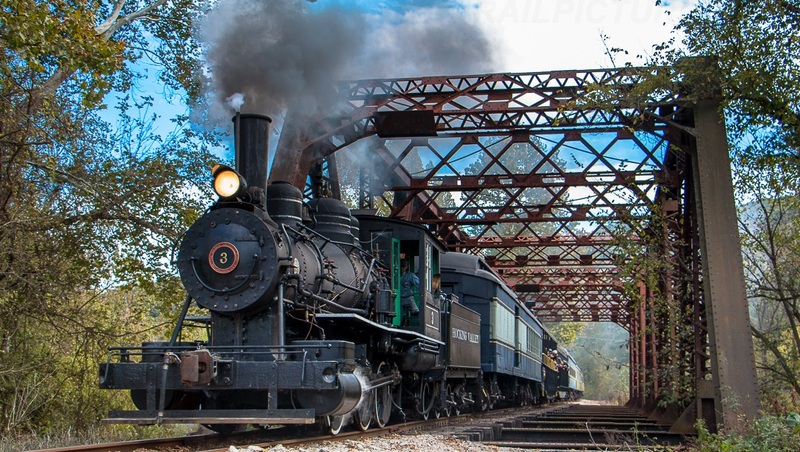 765 which has toured the United States as one of most famous steam locomotives of the former Nickle Plate Railroad. This trip will commence at 9:00 a.m. by bus transport from Bellaire, Ohio to the Brecksville, Ohio station. The group will be treated to a box lunch provided by the GSVSociety before passenger boarding of the train. The group will board the train following lunch and will depart Brecksville at 1:30 p.m. The train will travel to downtown Akron, Ohio, and then return to Brecksville on the two (2) hour trip. Passengers will enjoy two photo run by opportunities for video or pictures of the 765 at power. 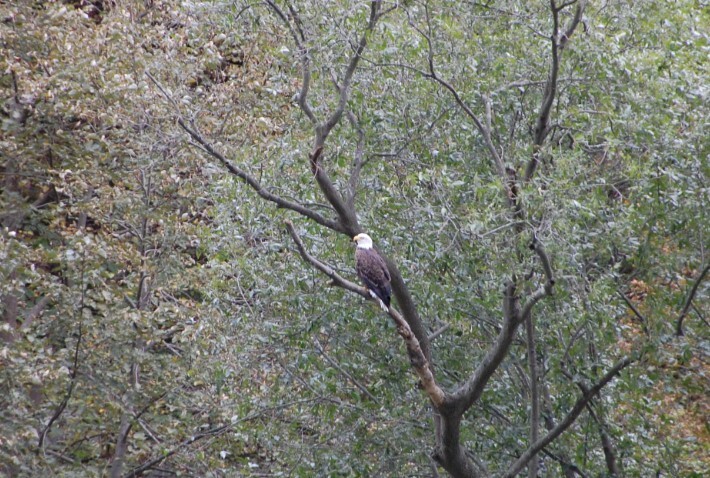 This trip will follow the Cuyahoga River Valley through scenic woodlands and marshlands inhabited by the American Bald Eagle. Bus transport back to Bellaire will arrive at 7:00 p.m.
GSVMEMBERS ticket price is $65.00, and NON-MEMBER PRICE IS $75.00. Prices include your bus transport, train ticket and box lunch. Only 53 tickets will be allotted to this trip for this group, so ORDER NOW TO AVOID BEING CLOSED OUT. Send your check or money order to: GSVSociety 765 Trip, P.O. Box 129, Bellaire, Ohio 43906-0129. Include the name, address, telephone number of each person who will be included in your party. The GSV Society is proud to announce our 3rd Annual GSV Celebration to be held Saturday August 16, 2014 from 11AM – 9PM at Union Park in Bellaire, OH. Attractions include: Civil War Cannon Blast, Historic Presentations, Native American Dancing & Drumming, Civil War Encampment & Horse Ride, Classic Car Show, Antiques Auction, Shadyside Community Band, The Diamond Project (Neil Diamond Tribute Brand), Crafters, Food Venders, Raffles, Spirit of America Train Rides, Spike – Wheeling Nailers Mascot, Children's Bounce House & Obstacle Course and more! Help us win $1,000 for our foundation. The non-profit that receives the most donations on May 6th will win $1,000. Please go to www.giveov.org on May 6th, 2014 and find us online under the Leaderboard to give. 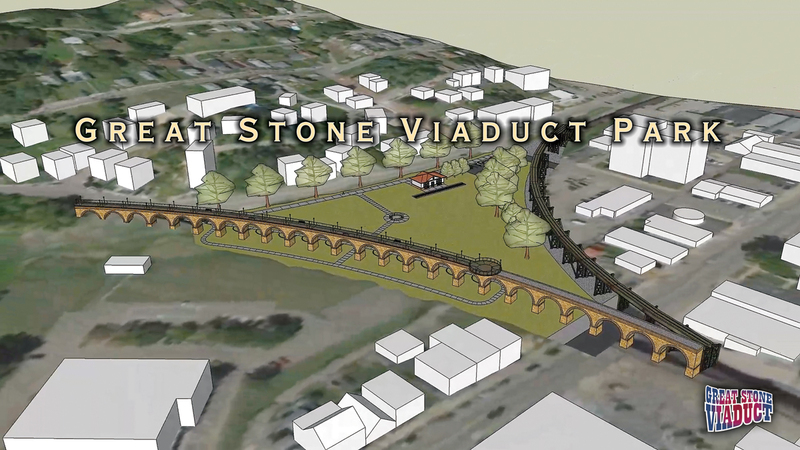 THANK YOU FOR HELPING US ACQUIRE AND PRESERVE THE GREAT STONE VIADUCT AND FOR YOUR CONTINUED SUPPORT! 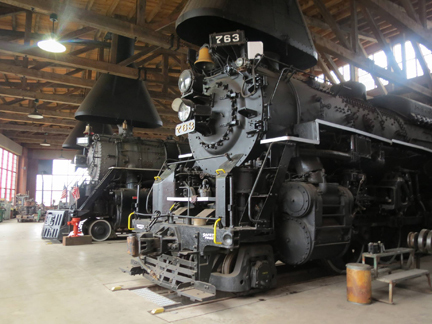 The GSV Society is planning a trip to the Age of Steam Roundhouse in Sugarcreek, Ohio on March 29. Price, which includes admission, lunch at Dutch Valley Restaurant and tour bus transportation from Bellaire, would be $95 for Charter & Sustaining Members and $110 for others. We will be departing from the Municipal Parking Lot at 32nd & Union Streets at 7:00 AM. Please call 740-676-7086 or email gsvsociety@aol.com for reservations and with any questions. grandpa/grandma, aunt/uncle or other adult. Again, no exceptions. For your convenience we have supplied the liability forms for both adults and minors as pdf files below. These will be collected prior to departure the day of the trip. Liability forms will also be available on the bus. “The Underground Railroad in Ohio” lecture which was to be presented by Dr. John S. Mattox on Wednesday, February 5, 2014 has been postponed due to weather related problems. John Mattox will be moved to the last week of the Series, Wednesday, April 2, 2014. 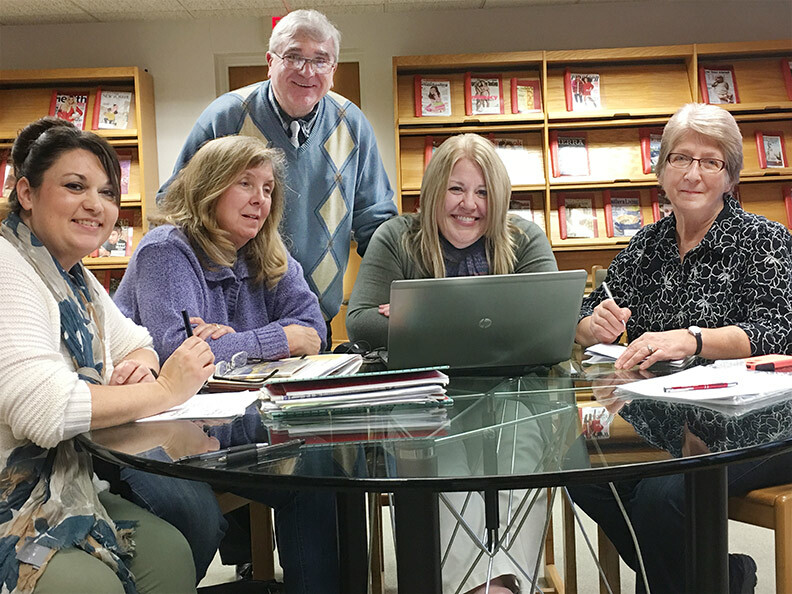 Held on Wednesday evenings during the winter months of February and March a decision was made by the GSV Society and the Bellaire Public Library to expand the lecture season this year from six weeks to eight weeks based upon the favorable response from those in attendance last year. The topics to be covered this year will once again bring together lecturers who are knowledgeable about the topics they present, while providing visual aids that will bring these topics to life. The GSV Society announces that two well known speakers James Dilts & John Teichmoeller have agreed to participate and present lectures at the Great Stone Viaduct Celebration scheduled for Saturday and Sunday, September 28 – 29, 2013. 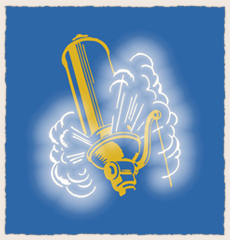 As part of the Second Annual GSV Society Celebration we will also be presenting our first annual Steam Whistle Expo Saturday and Sunday, September 28 – 29, 2013. The event will be located at the Belmont Community Health Center and have both live steam and compressed air demonstrations. Hank Marsilio of Eagle Mechanical LLC, in Youngstown will be bringing his coal and wood fired 1910 Reeves 150 psi live steam boiler and ASME certified manifold. Whistle enthusiasts can stage a whistle for a $20.00 donation. You must bring your own adapters and whistle valves. Dana Dolfi from Pittsburgh will be featuring his Great American Horn Machine. The world's loudest mobile musical instrument, his collection of truck, train and ship air horns and whistles is controlled by a MIDI decoder that can be played from a laptop computer. Everyone has agreed to pay an additional $20.00 for a charter bus to ride from Bellaire to Orrville. The Ohio President’s Coach has already been filled with 50 GSV Society members and friends and, since the response has been SO GREAT, the Orrville Heritage Club have opened a second coach for our group seating!!! We are now accepting reservations through July 15 for the City Of Orrville Coach. Ticketing is limited and our group rate is good only through July 15. You can mail your online reservation form or call 740-676-2743 to confirm that your check and reservation form is in the mail. Hope that you can join us!!! 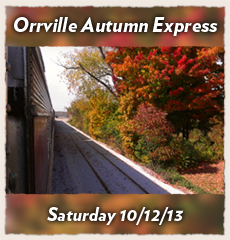 Join the GSV Society on Saturday, October 12, 2013, and ride the rails on the Orrville Autumn Express. A three hour stopover at A. I. Root Candle Company & West Liberty Commons for your shopping and dining pleasure. Re-boarding at Medina and continuing west to Spencer, before heading sourth toward Orrville passing en route Lodi, Creston, and Smithville with arrival at 6:00 p.m. The Great Stone Viaduct Historical Education Society is partnering with the Bellaire Public Library to sponsor a free Local History Winter Lecture Series during the months of January and February on Wednesday Evenings at 6:00 p.m. in the Community Room of the Bellaire Public Library. All of these events are open to the public. We hope that you can join us for one of the winter lectures on local history in the Ohio Valley. 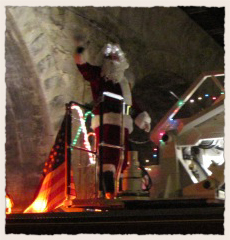 The Bus Tour sponsored by the Great Stone Viaduct Historical Education Society scheduled for Sunday, December 16 did not take place due to the OVRTA canceling the trip using their buses. The weather had turned poor during the last several weeks, and the road to Roseby's Rock was in deplorable condition making it impossible for the bus to travel the road. We express regret to those who had signed up for the event, but promise to reschedule the event when dryer weather prevails. We do want to share the brochure that was prepared for this event which you will find in the attached PDF's. The Great Stone Viaduct Historical Education Society will be sponsoring a local bus tour on Sunday afternoon, December 16, 2012 between 1:00 and 6:00 p.m.. Transportation for this event will be provided by OVRTA buses and will travel to the Great Stone Viaduct in Bellaire, Grave Creek and Roseby&apos;s Rock and Wheeling to the former Baltimore & Ohio Railroad Station that today houses the West Virginia Northern Community College. The cost of a ticket is $20.00 for Charter Members of the Society, and $25.00 to non-members. A sack lunch will be provided to all passengers. On November 24, 2012 The GSV Society participated in the Bellaire Christmas Parade. The GSVSociety will be participating at the Ohio Valley History Expo on Saturday, October 27 from Noon to 4 p.m. at the Ohio County Public Library. The event is open to the public and you can visit our booth during the day, along with many others who share a love of Ohio Valley History. We will have items available for sale and viewing at this event, and hope to see you there.